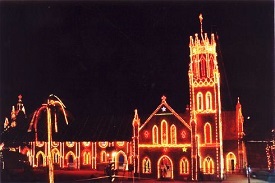 One of the most famous and important pilgrim centres of the Christians in Kerala, popularly known as St. Sebastian Church. It is located 22 kms. north of Alleppey.This church was established by Portuguese missionaries. The feast of St. Sebastian an 11 day festival is held here every January. One of the famous and well-known Christian pilgrim centre in Alappuzha coast.To decongest the festival days, a low profile festival, Ettamperunal, is being celebrated on the 8th day after the main festival. The devotees who flock to this church for worship mainly consists of those who have recovered from serious illness and the other who have escaped grave accidentsA peculiar votive of the church is Urulu nercha( an offering of a devotee by crawling on the ground). devotees crawl from the church premise to the local beach. Material offerings of the festival include gold and silver replicas of human limbs, bows and arrows. The festival has also chipped in for communal amity. On January 18, two days left for the main festival, thousands of Sabarimala pilgrims, while returning home, bathe from the church tank and pay homage to St. Sebastian. This church attract lot of devotees from Christian as well as non Christian every year from all parts of the state. The church is one of the important pilgrim centres of the Christians in Kerala. 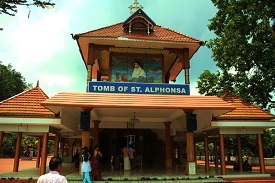 The mortal remains of Sr. Alphonsa, who was pronounced as blessed is kept in this church.The death of blessed Sr. Alphonsa which falls on the 20th of July is an important day. Manjinikkara Church is situated atop a hillock in the beautiful village of Manjanikkara, near Omallur, Pathanamthitta District in South Kerala Manjinikkara church derives its importance from the holy tomb of late Ignatius Elias III, the Holy Patriarch of Antioch. Members of the Jacobite Syrian Church believe that the Holy Father was a Saint. The Manjinikkara Church has now become one of the foremost places of pilgrimage. A large number of pilgrims visit the church regularly to receive spiritual and physical healing and blessings. 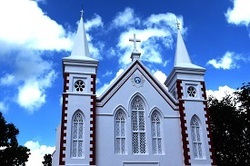 : This church is located in fort Koch. It is one of the India’s oldest European Church. 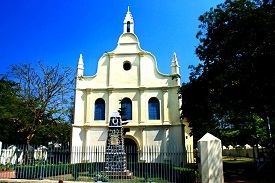 The first European church in India, which later became the model for building churches in elsewhere the country. Vasco da Gama, who died in Kochi during his second visit to Kerala, was buried in the churchyard of the chuch in 1524. later his mortal remains were taken back to his native land, Portugal.His tombstone still remains in the church. One of the oldest churches in India, believed to be established by St. Thomas during his missionary days in the state in AD 53. This Church is situated only 7 kms away from Tiruvalla. . Niranam Church is the mother Church of every churches nearby and also holds a lot of historical importance. 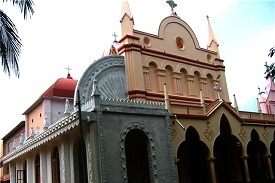 Niranam Church is the mother Church of every church nearby and also holds a lot of historical importance. The Apostle of Jesus is believed to have erected a crucifix and built a church there. Many local Hindus gradually embraced Christianity leading to the spread of the religion and later into the establishment of regional church. In all walks of life be they social, cultural, literary and political this tiny hamlet has preserved its traditions. The main religious festival honouring Holy Mary is on August 15. The birthday of St. Mary is celebrated on 8th September. St. Thomas Day( July3) is also celebrated with great zeal. This church is famous for it 8 days lent (Ettu Nombu) held on September 1- 8th every year and is attended by thousands of believers. 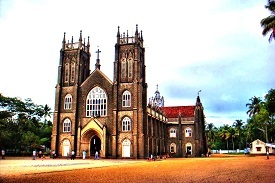 St. George Church, Edappally, Kochi was founded in 593 AD is considered to be one of oldest church in Kerala after the seven churches which was founded by St.Thomas. This is one of the major pilgrim centres in Kerala where even non-Christians crowd for veneration. Even during the week- days devotees throng the church to genuflect before the statue of St. George to express their gratitude for favours received through the saint. The festival begins on the 23rd of April with solemn High Mass and Litany. The 'Forty hour devotion' marks the commencement of the festival With each passing day divine aura is added to the festival along with color and festivity. The parishioners join the pilgrims to take the festival gusto into its crescendo. Mellifluent music and ear shattering fire works keep the tempo of the festival. On May Day, the St. George statue is taken out of its usual podium and pedestaled on specially decked chariot for procession which has all the features of a solemn catholic religious function. Curtain comes down on the festival with the High Mass on 4 May which will be embedded with a soul stirring sermon. It is one of the acclaimed holy spots in India.Vallarpadam, an enticing tiny islet is encircled by picturesque Kochi backwaters. The church on the eastern end of the island is a jewel on the island physique. Established in 1676 with the famous picture of the Blessed Virgin Mary was erected by Portuguese who brought it from their native land. It is believed that the picture has have miraculous powers. Being an islet, Vallarapadam had access only by water. "'Vallarapadath Amma", as the St Mary of Vallarpadam is called, is believed to have miraculously saved may lives from shipwreck and violent storms. The feast of Vallarapadath Amma is held on Sept. 24. The week-long celebration is accompanied by a big fair quite different. The products traded are country boats, cars, pots and straw mats. Festival of the Christ the King is on the last Sunday of October. High Mass, Vespers, a two-hour long Holy Eucharistic procession and benediction are the highlights of the festival. Nativity feast of the Blessed Virgin Mary is also celebrated with religious spirit.